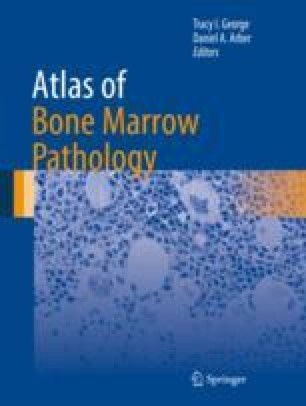 The vast majority of the non-hematolymphoid neoplasms in the bone marrow are metastatic in nature (Figs. 18.1, 18.2, 18.3, 18.4, 18.5, 18.6, 18.7, 18.8, 18.9, 18.10, 18.11, 18.12, 18.13, 18.14, 18.15, 18.16, 18.17, 18.18, 18.19, 18.20, 18.21, 18.22, 18.23, 18.24, 18.25, 18.26, 18.27, 18.28, 18.29, 18.30, 18.31, 18.32, 18.33, 18.34, 18.35, 18.36, 18.37, and 18.38). Accurate diagnosis and subtyping require careful histomorphologic examination with integration of immunohistochemical results and, in certain cases, cytogenetics and molecular genetic findings.